Race #1, Malmö, Sweden, 19 & 20 may 2018. Seven topgas racers were present at the first race of the Euroserie 2018. The track was in great condition, and it was warm and sunny all weekends. Defending champion Jörg Lymant came to Malmö being the favorite. But qualification went far from smooth for him. His bike was hesitating and he could not do better then a 5.5. Team Schack, still waiting for a gearbox, was absent, so ther Danish honour had to be defended by the team of Anders Jensen. Anders qualified #2 after a 5.2 seconds pass, and did another, quicker 5.2 later that day. They had to repair a rocker arm in the afternoon, and were optimistic for race day. The team of Martin Buehler from Switserland had arrived on friday morning with their supercharged "Bauer-Godden". A few attempts to make a pass, but Martin sill had not passed the finish line in the afternoon. So when his bike stopped again, at about 150 meters out, Martin walked it over the line, the run took 43 seconds, but at least he was qualified. At the end of the day, Martin made a complete pass on motor power, but stayed at the bottom of the list. 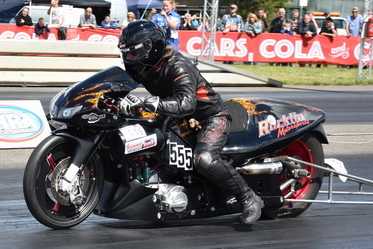 Sven Ole Schleichert was the only V-rod in the class that weekend. He had already race at the Mosten Springrace this season, and just like last year at Malmö, Sven Ole and Petra used all qualification rounds on saturday to practice their routine. Team Sweden, Jan Malmberg and Mats Larsson arrived friday evening at eight and immediately started working on Lars' bike. Mats had replaced the Motec, but could get it to fire up. First there was no ignition, later there was a problem with the fuel injection. Jan Malmberg's first pass was a 5.1, and he went quicker all rounds, with a 4.9 at the end of the day, quick enough to become top qualifier. Peter Niklas and Christian Bruhn still did not finish their new rides, so they entered the race with Peter on in the saddle of the turbo-Honda, and Christian as his assistant. They skipped the firsty few rounds of qualifications, and tried to qualify in the afternoon. After some attempts where the engine stalled after the launch, Peter managed to make a valid pass in the early evening and landed at place #4, so six people were finally qualified, barely enough to an 8-field on sunday. Sunday morning at the warm-up, Lymant's bike still did not sound the way it should. 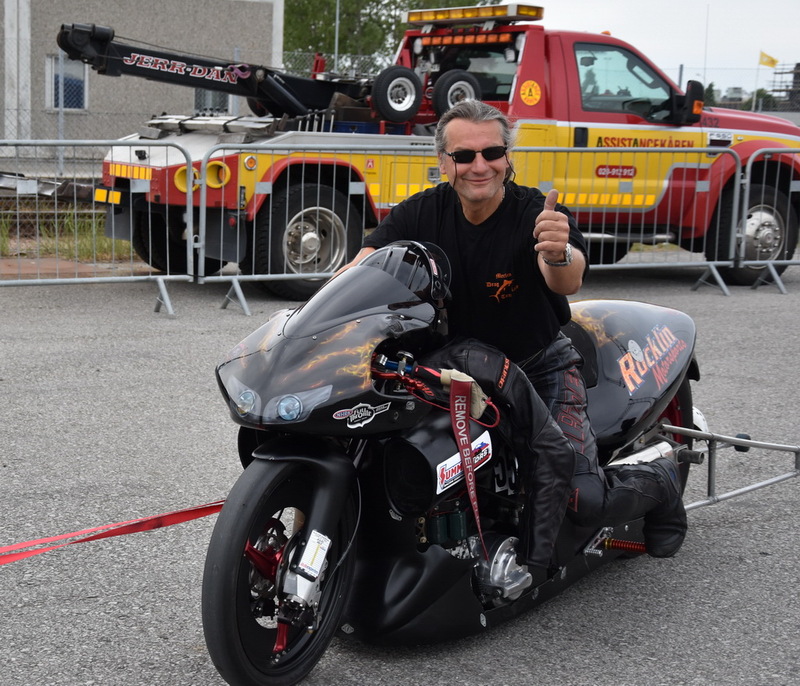 The team of Malmberg was optimistic, but the then the big upset: Jan's bike would not start when he got the sign to fire up for the quarter finals. Buehler's bike stopped after the launch, but that was enough for Martin to advance to the semi's. A very strong launch for Jensen, but the head gasket of the front cylinder was blown out after about 150 meters. Jensen beat Schleichert, but he was done after that. A disapointing passed by Lymant, as expected, but good enough to beat Niklas. Malmberg's bike started up without a problem when they got back in the pits. Jan could only scratch his head and wonder why. Only two racers left in the semi finals, and Martin Buehler decided to skip the burnout when he did his bye-run. Then again a poor run for Lymant, but enough to win lane choice in the finals. Jörg Lymand had tried many set-up's over the weekend, and he found the right one just in time. A fantastic 4.7 run in the finals was the result, leaving Buehler nowhere. Meanwhile, Mats Larsson kept working on his bike, and he got some help of many people, like "trouble shooter" Jörgen Lindskog. A great relief for him came in the afternoon, when the bike finaly came to life. After the race, the track was still open for testing, and Jan Malmberg used it to put a 4.8 on the clock. Looks like Jan and Mats are ready for the next race. But Mr Lymant is already far ahead! The next race will be at Alkerleben Airfield in Germany. Season's opener: EDRS, Malmö, Sweden: 19 may and 20 may.